Charles Benoît (left photo) partnered with Abel Bardin (right photo) in 1922 and designed their first motorcycle in 1923, a 175 cc (10.7 cu in) single cylinder two stroke moteured bike using outsourced engines. 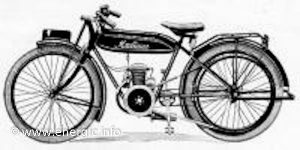 They where joined in a new partnership in December 1924 by Mr Jules Benezech, who brought the patents and the name Motobécane. 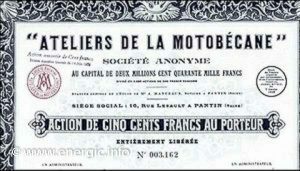 The 3 partners formed a new company called” Ateliers de la Motobécane.” Additionally apart from motorcycles under the patents and rights they could produce/construct moteurs/engines, power units, motor pumps and related machines. On the 31 January 1925 they patented the name Motoconfort to be used for motocyclettes (small moto cycles). In the same year motobecane produced a 308cm3 2 stroke moteur. Mr. Pierre Doranjou was given share for his help in the formation of the new company. 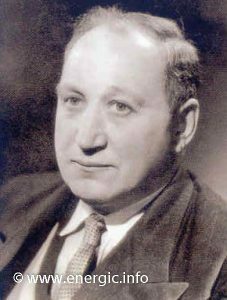 Infact in December 1925, Messrs. Bardin, Benoît, Terouache and Benezech joined forces to create a public limited liability company by action known as the Société des Ateliers La Motoconfort (SICAM) with a capital of 800 000 F. Residing at the address; 3 rue Hoche in Pantin. During 1927 they produced 350cc Type G, G2, G3 & Type H 500cc using lateral Blackburn engines. 1928 the model line up consisted of Type G, G2 & G3, and in 1929 – 350cc Type K, K2, K3 & 500cc Type H & H2 and also probably the 1929 Type L competition machine. 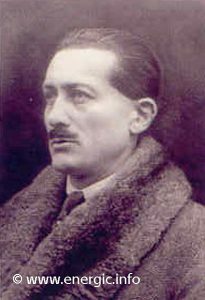 Charles Benoît continued to outsource moteur’s from Blackburn & Jap (with gearbox’s from Gras & Maignan, Staub, Picard, Albion, MC & Burman) till 1930 when they designed there first in house moteur. 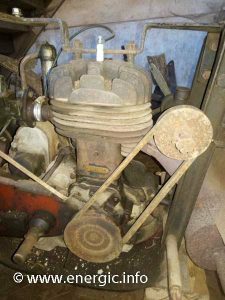 During the 1930s, they manufactured a longitudinal shaft-drive inline four moteur motorcycle in 500 and 750 cc (31 and 46 cu in). During this period, the firm entered road racing competitions and won the Bol d’Or endurance race. In 1981, Motobécane filed for bankruptcy, and was subsequently purchased by Yamaha and reformed in1984 as MBK. 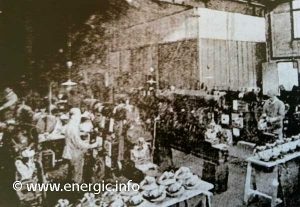 The first moteur used in the Energic motoculteur range was the 2 stroke E type 250cc (247cc) moteur in early 1930 in the B1 model. 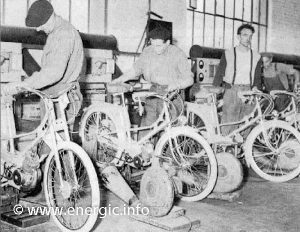 Later that year the B bloc lateral engines where used in a new model the Energic motoculteur C7; starting with the B4L 350cc and latterly in 1931 in the Energic motoculteur D9 B5L 500cc. The B4L engine is rare but the B5L is as rare as “hens teeth!“.The B5L engines where only used for a very short period of time in the Energic range (6 months) due to supply and limited production for just 1 year – until the introduction of the S Bloc range. In late 1933/early 1934 the new R/S bloc lateral 250cc, 350cc and 500cc became available from motobécane. 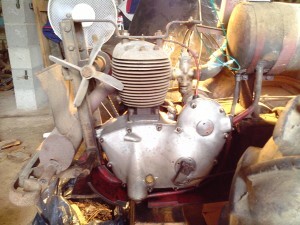 The 350cc and 500cc engines was fitted in the Energic motoculteurs C7 & D9 models respectively. (The B series motobécane engines motoculteur was discontinued in favor of the S bloc – sometimes the motoculteurs plaques showed D9 M9 but had S9 motors in this transition period). 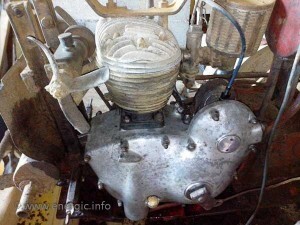 Motobécane continues to manufacture the S bloc engine and use it in its motorcycles till after the war approx., 1947. (The bloc R being the Routier version, of the later Bloc S – in motorcycle trim). Energic motoculteurs use the R bloc but all is referred to as a S bloc in motobécane moteur terms, from its introduction, as this is the most common engine variant. The new S bloc, with its increased oil/cooling and lubrication efficiency – through the use of a separate oil reservoir (tank) situated next to the fuel tank operating a float valve regulation, was a big step forward in the motorization of the Energic motoculteur. The new engines probably came on stream with Energic models from early 1934, after spare and stock of the B4L moteurs where used up. 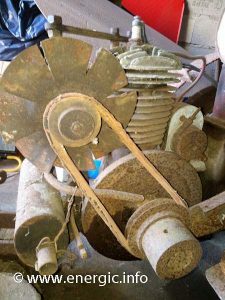 The C7/D9 motobécane S bloc Energic motoculteurs where still available in up to late 1945 (using up the old stock inventory – I know of 2 machines that where bought after the war as old stock). There availability overlapped with the introduction of the totally new in house produced Energic motoculteur 409 3v (engines totally Energic – not out sourced). I have a machine that was bought new, one owner, in late 1944 a Energic motoculteur D9 (S bloc spec.). 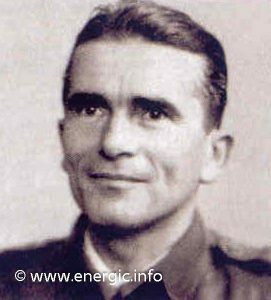 And I have seen an order dating from June 1942 for the New Energic motoculteur 409 awaiting homologué, with information showing authorizations relating the New Energic motoculteur 409 as early as 20 May 1941. See motobécane moteurs/engines in Energic motoculteur B1 here. 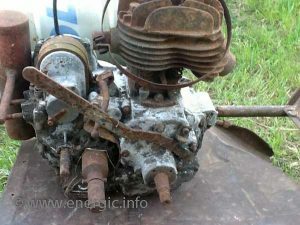 See motobécane moteurs/engines in Energic motoculteur C7 4BL here. See motobécane moteurs/engines in Energic motoculteur C7 S bloc here. See motobécane moteurs/engines in Energic motoculteur D9 S bloc here. 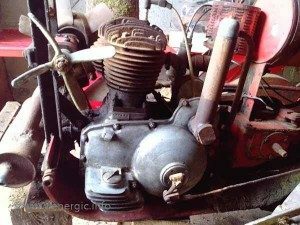 See motobécane moteurs/engines in Energic motoculteur D9 5BL here.